Reigning champion Alex Marshall reached the semi-finals of the World Indoor Bowls singles with a masterly win over fellow Scot Stewart Anderson. Marshall, who is chasing a seventh world title, defeated the 2013 champion 10-2 9-2 in Norfolk. He will take on Robert Paxton on Saturday after the fourth seed defeated unseeded fellow Englishman Jamie Chestney 7-3 7-7. And world number one Nicky Brett faces Scotland's David Gourlay. Brett defeated fellow Englishman and former champion Greg Harlow 9-3 7-7 before Gourlay, the 1996 champion who is the sixth seed, beat English qualifier Mathew Orrey 9-3 5-4 in the evening quarter final. Marshall was highly satisfied with his performance against Anderson, which he rated one of his finest in an indoor arena. "I think that's the best I've performed on the portable rink despite having many great occasions here," he told BBC Sport. "I felt so comfortable out there and felt I could have beaten anything. "Stewart is a fantastic player and just wasn't at his best today, but Stewart will be back and will win this tournament again sometime." Marshall insisted he was taking one game at a time and not thinking of extending further his record number of world titles. "Robert Paxton is playing brilliant, so it will be another tough game," he said. "But, if I can perform like that, I'll give myself every chance." 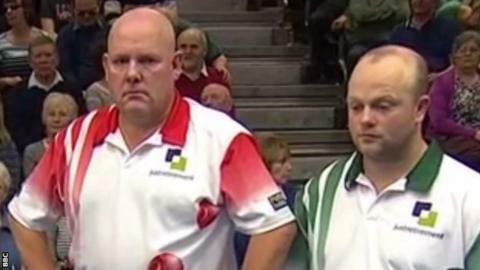 Anderson, who only managed to win four ends to Marshall's 12, acknowledged his fellow Scot was in devastating form. "Alex was unbelievable," he said. "That was some performance." Harlow had taken his place in the quarter-finals by ending Darren Burnett's hopes of a clean sweep of titles after Scotland's Commonwealth Games gold medallist won the men's and mixed pairs titles at the start of the week. Brett, aiming for a first appearance in the final, looked poised for a straightforward win over Harlow until the 2010 champion fought back from 3-1 down to lead 7-5 in the second set. However, the world number one won the final end to progress, and admitted: "I had a major piece of fortune at 6-3 down just when Greg looked like he was going to win the second set."